Before information was readily available at the push of a button or a quick Google search, seeking out a possible standardbred star was based on an old-fashioned, blue collar-type approach to research. Wallace is certainly glad Quebec-based horse owner Daniel Plouffe did his homework and purchased the ridgling for $47,000. If he hadn’t, neither man would have been along for the thrill ride engineered by the brilliant Blissfull Hall en route to an induction into the Canadian Horse Racing Hall of Fame. Two years later, Blissfull Hall captured harness racing’s elusive Pacing Triple Crown for Plouffe, Wallace, and driver Ron Pierce. A racing career of 31 races over two seasons included a record of 19-4-6, a mark of 1:49.2, earnings of $1.4 million and wins in the American National, the Adios, the Cane, the Messenger, the Simcoe Stake, the Little Brown Jug, an elimination of the Breeders Crown and the Progress Pace. 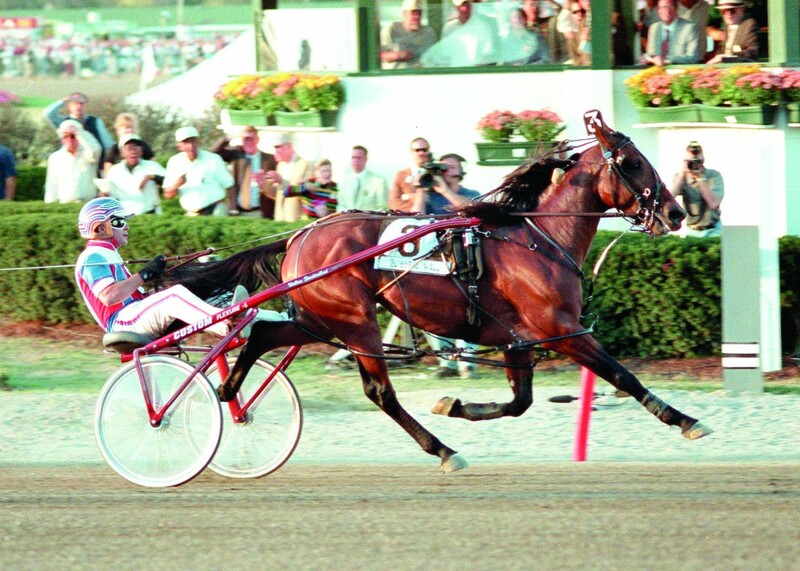 He was the recipient of the 1999 O’Brien Award for Three Year Old Pacing Colts/Geldings and 1999 O’Brien Award for Horse Of the Year and 1999 USHWA Dan Patch Award for Three Year Old Pacing Colts and Winner of 1999 USHWA Dan Patch Pacer Of The Year. 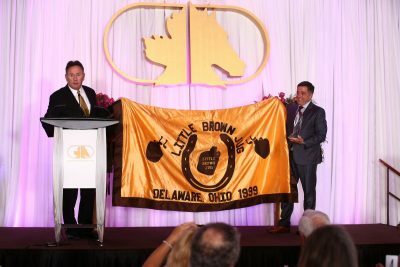 His phenomenal 1999 campaign will forever be associated with his victories in pacing’s Triple Crown events – the Cane Pace at Freehold, the Little Brown Jug at Delaware and the Messenger (Plouffe paid a $35,000 supplementary fee) at The Meadows. In the Jug, driver Pierce employed a perfectly-timed move with a quarter of a mile to go, seized the lead nearing the top of the stretch, and held off the late rush of Looking For Art to take the 54th edition of the event in front of nearly 52,000 fans. In what was the Jug’s first raceoff since 1992, Blissfull Hall won by a length as the 4-5 favourite in 1:55.3. The raceoff came to be after Looking For Art’s upset triumph in the second elimination. Ben Wallace presents Daniel Plouffe with Blissfull Hall’s Little Brown Jug blanket. His offspring have earnings of over $74 million on the track. That includes 85 horses with earnings over $250,000, 228 horses with earnings over $100,000, and average earnings per starter of $99,762. His progeny include millionaires Marnie Hall and Camelot Hall. Blissfull Hall’s stallion career concluded in 2017 after spending a few years at Empire Stallions in Australia. Arrangements were made to have him turned out at Schare Adams’ Saga Farm, not far from where he was foaled at Walnut Hall on March 26, 1996. 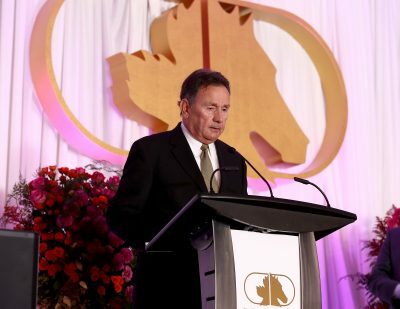 And now, he’ll have another home, so to speak, as a permanent member of Canada’s Horse Racing Hall of Fame. When asked for one word to best describe Blissfull Hall, Wallace paused briefly before he gave his answer. 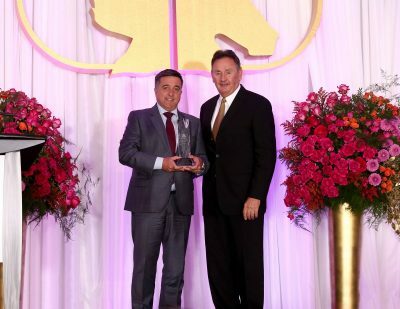 Blissfull Hall’s owner Daniel Plouffe and trainer Benjamin Wallace receive the trophy acknowledging the pacer’s induction to the Canadian Horse Racing Hall of Fame.